Bacterial spot is caused by four species of Xanthomonas and occurs worldwide wherever tomatoes are grown. Bacterial spot causes leaf and fruit spots, which leads to defoliation, sun-scalded fruit, and yield loss. 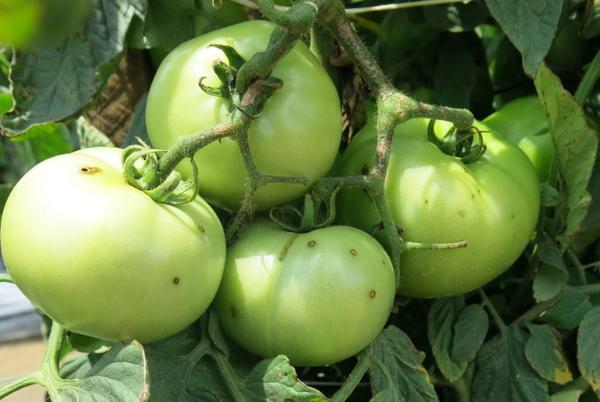 Due to diversity within the bacterial spot pathogens, the disease can occur at different temperatures and is a threat to tomato production worldwide. Disease development is favored by temperatures of 75 to 86 ℉ and high precipitation. In North Carolina, it is more prevalent in seasons with high precipitation and less prevalent during dry years. Bacterial spot leaf lesions caused by Xanthomonas euvesicatoria on pepper seedlings. The disease is caused by four species of Xanthomonas (X. euvesicatoria, X. gardneri, X. perforans, and X. vesicatoria). In North Carolina, X. perforans is the predominant species associated with bacterial spot on tomato and X. euvesicatoria is the predominant species associated with the disease on pepper. All four bacteria are strictly aerobic, gram-negative rods with a long whip-like flagellum (tail) that allows them to move in water, which allows them to invade wet plant tissue and cause infection. On tomato, leaf lesions are initially circular and water-soaked and may be surrounded by a faint yellow halo. In general, spots are dark brown to black and circular on leaves and stems. 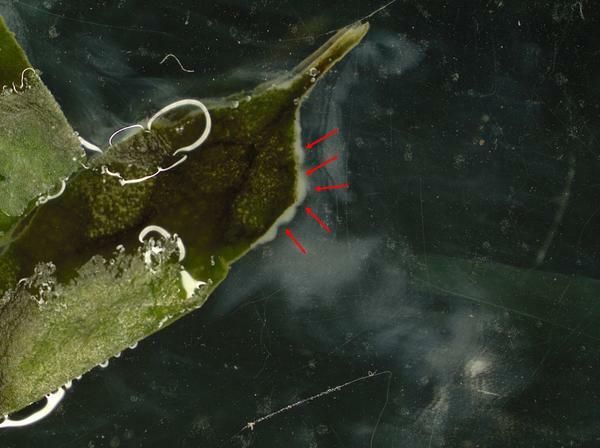 Spots rarely develop to more than 3 mm in diameter. Lesions can coalesce causing a blighted appearance of leaves and a general yellowing may occur on leaves with multiple lesions. 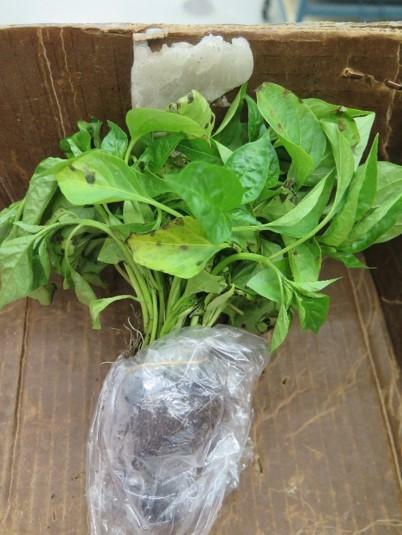 Infected pepper leaves drop prematurely; this exposes fruit to the sun and results in sun scalding. Fruit lesions begin as small, slightly raised blisters, which become dark brown, scab-like, and can appear slightly raised as they increase in size. 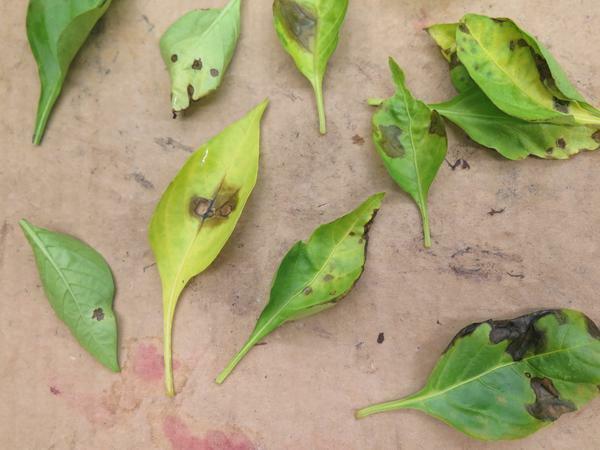 On leaflets, bacterial spot can be easily confused with the early symptoms of bacterial speck, early blight, gray leaf spot, target spot, or Septoria leaf spot. When Xanthomonas is present, bacteria will ooze (also referred to as bacterial streaming) from infected tissue and can be observed under a light microscope. Bacterial streaming will not be observed in lesions caused by fungal pathogens. Bacterial spot on tomato leaf. Bacterial spot on tomato fruit and petioles. Infected plant tissue such as seeds, transplants, tomato and pepper volunteers, and crop debris are all potential sources of bacterial spot inoculum. In North Carolina, most disease outbreaks can be traced to contaminated seeds or diseased transplants. Disease development is favored by temperatures of 75 to 86 ℉, and high precipitation and humidity. The pathogens can invade the plant through natural openings (e.g. stomata and hydathodes) and wounds. Bacteria can move within fields by wind-driven rain, irrigation droplets, aerosols, and the handling of wet plants. The longer the plants are wet, infection is more likely to occur. 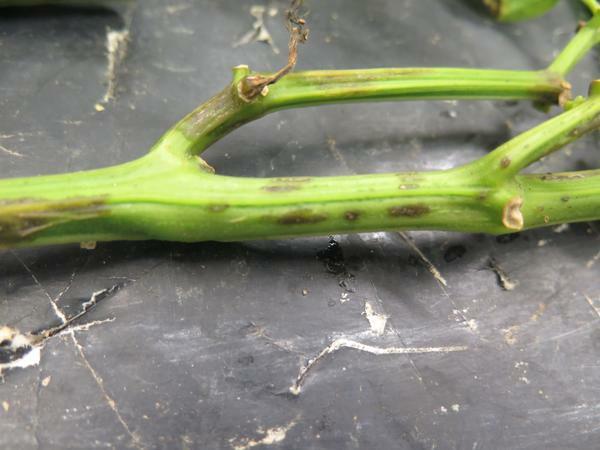 After initial infection, the disease can spread rapidly throughout an entire field or greenhouse. The bacterial spot pathogens can be recovered from non-symptomatic plants as early as one week at distances of up to 4 m from symptomatic plants. 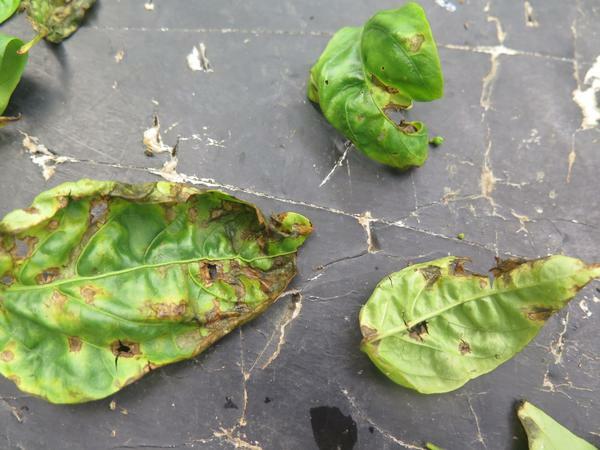 In the greenhouse, the disease can spread up to 2 m to neighboring plants from symptomatic plants within three weeks due to overhead irrigation. Bacterial spot leaf lesions caused by Xanthomonas perforans on greenhouse tomatoes. The most effective management strategy is the use of pathogen-free certified seeds and disease-free transplants to prevent the introduction of the pathogen into greenhouses and field production areas. Inspect plants very carefully and reject infected transplants- including your own! In the greenhouse, discard trays adjacent to outbreak location to minimize disease spread. Treat seeds with dilute bleach, hydrochloric acid, or hot water to reduce the potential for seedling infection. However, this seed treatment is not recommended for producers that use pelleted seeds as it will remove the pelleted coating from seeds. These treatments may also reduce seed germination. Perform a test treatment on approximately 50 to 100 seeds and check for the effect on germination before treating an entire seed lot. For specific instructions and recommendations please consult the Southeastern US vegetable Crop Handbook. In transplant production greenhouses, minimize overwatering and handling of seedlings when they are wet. Trays, benches, tools, and greenhouse structures should be washed and sanitized between seedlings crops. Crop rotation should be used to avoid pathogen carryover on volunteers and crop residue. Avoid fields that have been planted with peppers or tomatoes within one year, especially if they had bacterial spot previously. Eliminate solanaceous weeds in and around tomato and pepper production areas. Keep cull piles away from field operations. Do not spray, tie, harvest, or handle wet plants as that can spread the disease. Several fungicides are labeled for use on tomato and pepper to manage bacterial spot (Table 1). All products provide the best control if applied preventatively; there are no curative products for bacterial spot management. 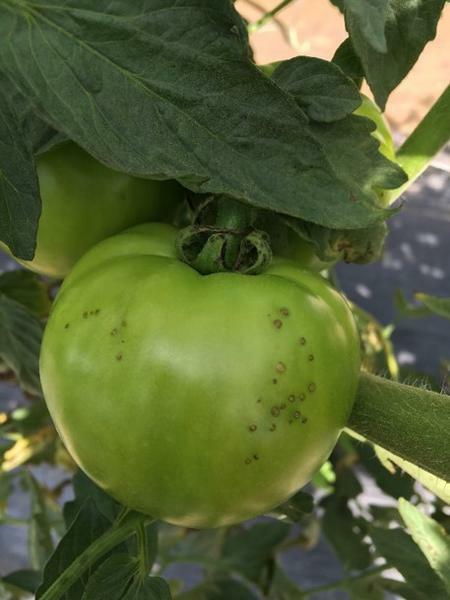 For the latest fungicide recommendations for southern blight of tomato and pepper, see the Southeastern US vegetable Crop Handbook. Fungicide labels are legal documents—always read and follow fungicide labels. Table 1: Fungicides labeled for use on pepper and tomato to manage bacterial spot in North Carolina. 2Use full rates of fixed copper in combination with mancozeb for best results. 3Consult with your vegetable extension specialist for information on the requirements needed to use bacteriophages. Bacteriophages are most effective when applied during or after last watering of the day. This disease factsheet was prepared by the Meadows Plant Pathology Lab. Funding for updating this fact sheet comes from the United States Department of Agriculture (USDA)-National Instiute of Food and Agriculture (NIFA) (2017-70006-27141).